liked the colour and was impressed by the speed with which the project took off (pun intended, sorry!). Inspiration is in fact everywhere. On the outbound flight I was quite overwhelmed by the colours of Transavia… haha! On the homebound flight I could have sold lots of slinky, green scarfs to the lovely female cabin attendents. They would have been a perfect match for their uniforms. This is a nice project for travelling – I brought only 2 bamboo double pointed needles and a ball of wonderful green Marinella Sea Silk (a gift from my friend Susan). 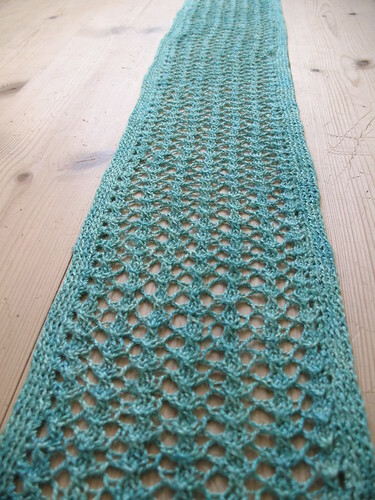 A long narrow piece of knitted lace with a crocheted border. 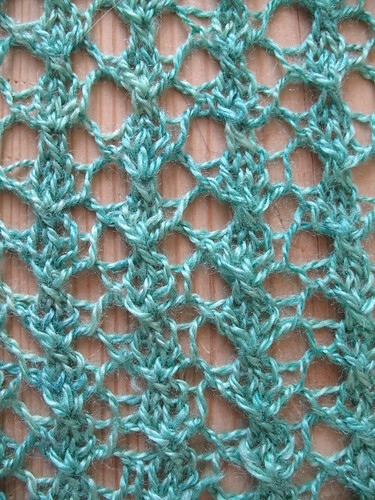 Cast on 23 stitches, knit 1 row, purl 1 row. and repeat until the length is suitable for a scarf. The length of my scarf is equal to my height. Bind off loosely, but DO NOT break the yarn. 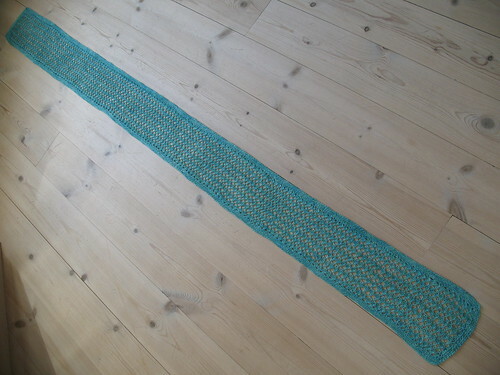 Grab a crochet needle and start crocheting the border. Two double crochets (UK) through each of the lacy holes along the sides of the scarf is suitable. Remember to make an extra double crochet at each corner. When you start working the second round you must remember to crochet through the back loop of the stitch below! This will make the border quite elastic and at a glance you would think it was knitted on. I made 4 rounds before finishing the scarf. Does that all make sense? It’s a recipe – make it your own! You can replace the lace with any kind you like, you can replace the border, you can use any yarn you have in your stash, you can even use that colour that you’re not really sure about – it might just be great as a slinky scarf! As always, please let us know how you go! 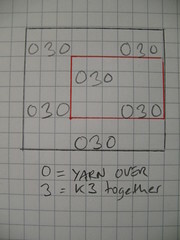 I’ve made a diagram of the lace pattern. 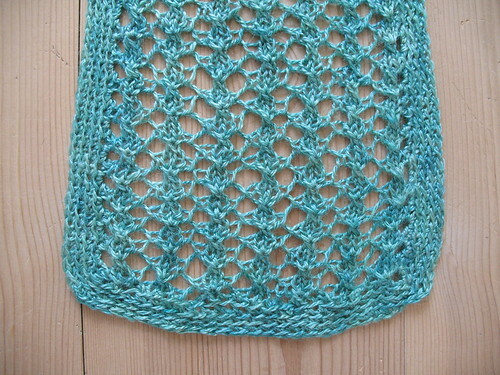 This entry was posted in Free patterns and tagged crochet, Easy as pie, lace, scarf. Bookmark the permalink. Yes it does all make sense! Will be properly floppy in silk, exactly how a lace scarf should be. Thank you! I was looking for the lacy solution for every odd ball I have, and you did the dig-out-the-stitch-dictionary work for me! I hope mine comes out as beautiful. Lovely pattern! I’m printing it out right now. Thank you for sharing it.